Bandwidth calculator is a simple tool which will let you determine the download time for a file of a given size, give your internet speed or the other way around - it may use it as a download speed calculator, when you know the time and file size. The most commonly used unit of bandwidth is Mb/s (megabytes per second). To find out what Mbps is, see below. Most likely you'll want to use it as a download time calculator, but know that our bandwidth calculator works either way you want - you can provide download time and filesize to figure out the speed at which it was downloaded (it essentially becomes a download speed calculator). If you provide the download speed and the time, it will calculate how much data may be downloaded. 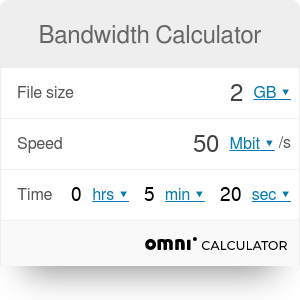 As with all our tool, bandwidth calculator is just as flexible as you want it to be! Mbps or Mb/s stands for megabits per second or, in other words, millions of bits per second. . One byte is 8 bits, so those values would be 8 times smaller. Bandwidth Calculator can be embedded on your website to enrich the content you wrote and make it easier for your visitors to understand your message.